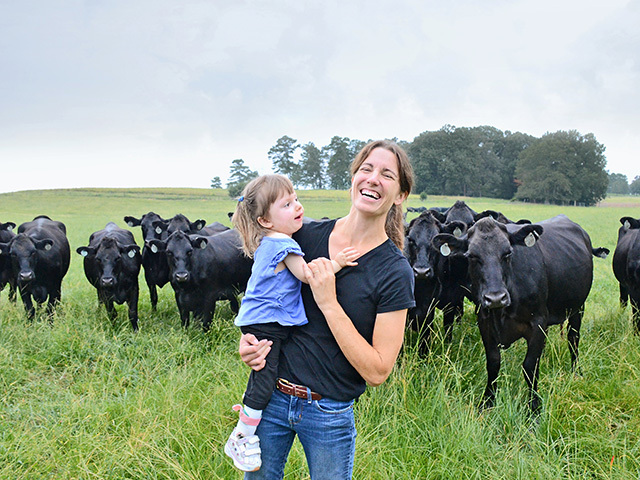 This Southern farmer is building a new legacy on the red dirt of the farm where she grew up. Jamie Blythe stands atop a red-clay knob one August afternoon. As this is Alabama, the humidity and the temperature blend into the 90s. Even the cicadas buzzing in the background are hot. Corn and soybeans trace the roll of the hill down past a finger of hardwoods and onto a flat bottom. It's a pretty view of Blythe Cotton Co.–3,600 acres of red clay and sandy loams, where no plow has touched its soils in more than two decades. "It is home, a family member," Jamie says of this place where she grew up. "It takes care of us, just as we take care of it." When timely rains fell over these soils in 2017, magic happened. Blythe Cotton Co. averaged 223-bushel corn. "For this part of the world, that's great," Jamie says. The cotton crop yielded 2Â¼ bales per acre. Full-season soybeans hit 72 bushels per acre. Winter wheat topped 100 bushels. Cattle are the most suitable crop produced on some of Blythe Cotton's Co.'s less-crop-worthy soils. These pastures support one cow to 2 acres. After a difficult struggle with anaplasmosis, Jamie is rebuilding her herd–Angus-Holstein heifers with horned Hereford bulls–to about 60 to 70 animals. Jamie expects satellite and drone imagery will become increasingly central to her agronomic management strategies. Both are actionable–she can identify an issue and address it. Zone management is cutting input costs–Jamie uses the word, "slashed"–while maintaining a net profit on even less productive ground. "If we can maximize how we put out our inputs, maximize our inputs and our labor force, that's what is going to keep us in business."